Ready to ship Brass Valve Tags are available in nearly 30 different abbreviations as well as tags without an abbreviation. 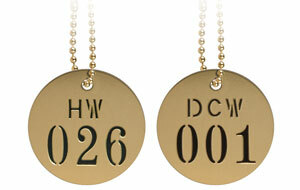 These Stamped Brass Valve Tags are stocked in 1-1/2" dia. round brass, in sets of 25 consecutive numbers from 001 to 400. Using PipeMarker.com’s customization tool, you can create your own sequence of custom valve tags or unique individual tags. Select from a number of durable materials and have your custom valve tags engraved, stamped, or laser etched. If you'd like personal assistance contact customer service at 800-274-6271 or via online chat. 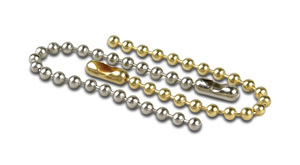 PipeMarker.com offers a wide variety of valve tag accessories including Brass Beaded Chains, Nylon Ties, Steel Stamps, and more. 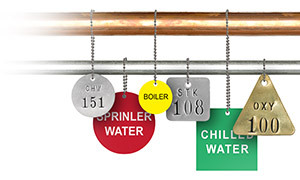 Our valve tag accessories help with the installation of Valve ID tags throughout your facility. If you require items that are not displayed here, please contact Customer Service at 800-274-6271 or use our Online Chat.